My intention on my birthday, November 30, was to delete refined sugar and wheat from my diet for one month. During the first two weeks I noticed that I hit an occasional Y in my path giving me the choice to take the familiar route and eat the same foods or take the unfamiliar route and reach for new foods. To my surprise I kept choosing the new path. At a recent Gregg Braden workshop I learned that any new thought, feeling or action creates a new neuron in the brain. I was surprised at how easy this was this time around. My whole brain-body was and continues to be ready! Last Sunday, fourteen days into the cleanse, a friend brought me German holiday bread that she had made. I was feeling tired and reached for a slice without hesitation. I ate some and it was so good. Yesterday I ate a few chocolate chips and a cookie. Am I “going off the wagon.” Why am I now choosing the old route? I notice feelings of sadness and thoughts of negativity and conclude—I am detoxing! This cleansing is very personal as I remember (in shamanism this is a “re-membering” of a lost soul part) that little girl in the third grade who was called “Fatty Patty.” Deep emotion wells up bringing tears. I keep reaching back for her to love her now as I could not then. I am not off the wagon. I continue on track with foods that give me vitality such as oranges, pineapple, raw cashews, salads, beets, spinach. Which reminds me of Balboa, a spirit guide who instructed me, years ago, to eat spinach and beets. Balboa must be cheering me on from the other side, the spiritual dimension. And so it goes. Consciousness. Rippling out through feedback loops through outer space of multidimensions and inner space of my psyche. Feedback loops making all things new. I attended my District’s Democratic General Meeting last night. The facilitator commented on the “Bernie t-shirts” in the room. Yes, Redmond for Bernie was there — four of us. They were seeking precinct committee officers and, to my surprise, I stepped forward. To be voted in I was asked to say something about myself. This was not planned so I let the words flow saying that I had worked at a peace and justice organization and became tired of angry people working for peace. Some people got it and chuckled. I said meditation was my way to peace and that we need to change ourselves as well as our systems. I mentioned that I had written a book about my spiritual journey and in my simple minded/hearted way I asked: “Is this okay here?” They said yes and I was approved with a room full of raised hands. So, I will attend a Presidential Precinct District Caucus Training this spring and start knocking on neighbor’s doors to invite them to vote…for Bernie. Yes, it is okay for me to promote Bernie as a precinct committee officer. There were two speakers at the meeting who talked about Trans Pacific Partnership Trade and Agreement. One was pro and the other anti. There was rebuttal and questions from the audience. One of the speakers used the word “competition” to describe the interaction of countries in this agreement. My mind and heart changed the word to “cooperation.” Each country has something unique to contribute in the same way flowers contribute in a garden and musical instruments contribute in an orchestra. Language changes when we see with new eyes. And, yes, I am gutsy enough to say this in a public forum. This morning I lighted my red candle (a birthday gift) and meditated. Immediately I saw and felt (this is a sensorial way of seeing) myself stretched upward with an elongated torso. I asked for support from my angelic guides who live in other dimensions. I then sensed the presence of a coiled serpent. 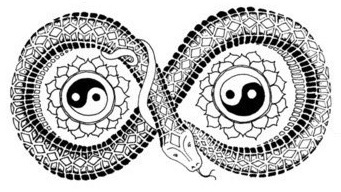 I have a logo (communitythreads.net) that represents this serpent who came to me in a dream many years ago. I thought it was a salamander until I wrote my book S/He Dragon ~ How I Found My Wings and suddenly realized — this was a baby dragon! I have been watching and listening for the next entry on this website. It has felt like a void with nothing moving. Familiar with this creative process I stayed in the void listening and watching for Spirit to move. Today I add the next piece to my “bowl” of life. This bowl is different from the Kintsugi bowl that is pictured in a recent post. This bowl is pieced together organically through a natural process and held by a coiled dragon. This bowl is my book of life.